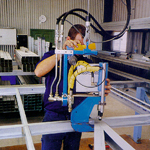 Manual hydraulic riveting systems have been produced by Henrob since 1985. Many of those early systems are still in service today, a testament to their design and high quality components. A standard system is configured with a hydraulic power-pack delivering oil via flexible hydraulic hoses to a tool consisting of a C-frame mounted rivet setter and upsetting die. Activation is by either a switch handle (mounted on the back of the C-frame) or a foot switch. A cost-effective solution for low volume applications. This single-phase 115/220/240 VAC unit can be readily moved around a workshop. The high-pressure rivet setter is compact and lightweight, affording good mobility. For fast cycle times and long hose runs, commonly up to 25 metres. This is a true workhorse capable of continuous production in the most arduous environments. The rugged and simplistic construction lends itself to minimal and basic maintenance, well within the capabilities of most workshop personnel. This incorporates high force clamping prior to rivet insertion. This technology was initially developed for the automotive industry where superior joint quality is required. These systems have proven their reliability in service for many years.